Driving to France: ferry or Eurotunnel? It’s an annual decision. 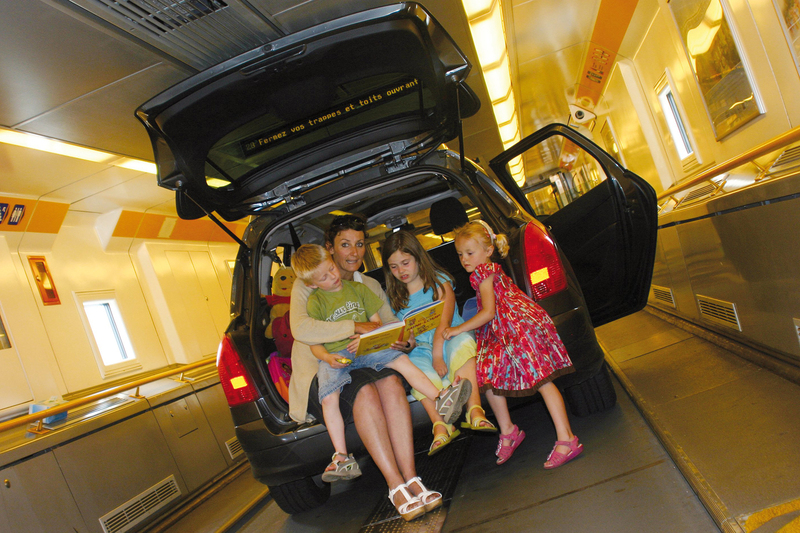 Take the car ferry to France, or pop the car on the train? For many it’s a conclusion they came to years ago. Now, throw away your prejudices and take a fresh look at the pros and cons. With Eurotunnel you’ve only once choice – its down the M20 down to Folkestone. The Dover-based ferries also depart from the much same area of the south east of Kent, and end up a few miles apart from each other in Calais. Dover and Folkestone are some 65 miles from the Dartford crossing on the M25. You don’t have to go to Calais. DFDS Seaways runs a Dover-Dunkirk service, which places you 25 miles up the coast closer to Belgium, Holland and Germany. How quick is a short crossing? Speed is why most people choose Eurotunnel. The crossing time to Calais is 35 minutes. P&O and DFDS take around 90 minutes to do the same, or two hours to Dunkirk. Factor in a 60-minute check-in, though, and the difference between train and ferry becomes 95 minutes and 150 minutes. What about the long ferry crossings? Getting you closer to central and western France will require a longer – and more expensive – ferry crossing. It takes approximately four hours to get to Dieppe, six to Caen or Roscoff, and between eight and 12 to St Malo or Le Havre. Overnight crossings tend to take longer than day crossings, so that you can disembark at a respectable time of the morning. Brittany Ferries also has a high-speed ferry from Portsmouth to Cherbourg that takes just three hours. How long is a piece of string? ‘Fluid’ pricing is commonplace, so that when sales have been high, the best deals disappear – just like Ryanair and Easyjet. Last-minute bookings in August, for a family of four with a car on the short crossings, are around £220 for the ship to Calais, and closer to £300 through the Eurotunnel. Reckon on saving a third of that on the ferries by booking a year ahead. 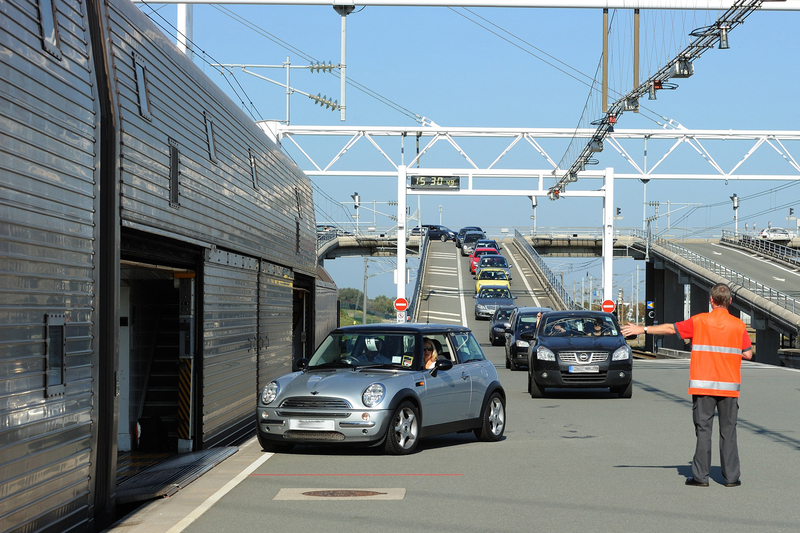 Eurotunnel hasn’t published fares that far in advance, but there will be deals too. Brittany Ferries, with its longer crossings, is naturally more expensive, and at short notice it was hard to find a crossing for less than £600 at the weekend, rising to nearer £800 on the popular St Malo crossing. So which is best: ferry or train? 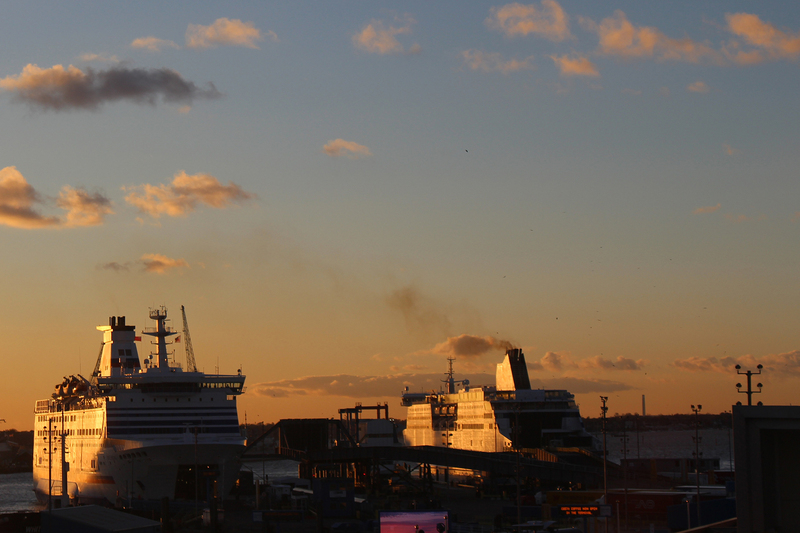 In my view, the ferries win hands down, every time. Do I want to save an hour of my life simply to travel in metal tube, at best industrial-chic, but to my thinking more like putting my car and my family into a larger version of an Underground train? Can I relax here, go for a pleasant walk, get some decent food, find a nice place for a wash and brush up? You already know the answer. By the time I get to Dover, and I live only 100 miles away, I am ready for a meal, a break, and a tangible sense that I am going on holiday. The ferry does all that for me, and more. Take a long Brittany Ferries crossing and I can step the whole experience up a further notch, with fantastic restaurants and comfortable cabins. My advice is there’s no need to be in such a rush. Chill out and take the boat. https://www.motoringresearch.com/wp-content/uploads/2017/08/01_Channel.jpg 1200 1800 Peter Burgess https://www.motoringresearch.com/wp-content/uploads/2018/12/mr-top-motoring.svg Peter Burgess2017-08-08 10:56:092018-07-27 12:26:08Driving to France: ferry or Eurotunnel? In the case of The Manor of the Automobile – or Le Manoir de L’Automobile – looks can be deceptive. Arriving from the pretty Brittany village of Lohéac – and ignoring the obvious clue of the circuit on the right-hand side – you might think you’ve arrived at a farmhouse for Cidre Breton and crepes. But behind the pretty facade is one of the most remarkable car museums in Europe, with more than 400 vehicles of all types, ages and nationalities on display. 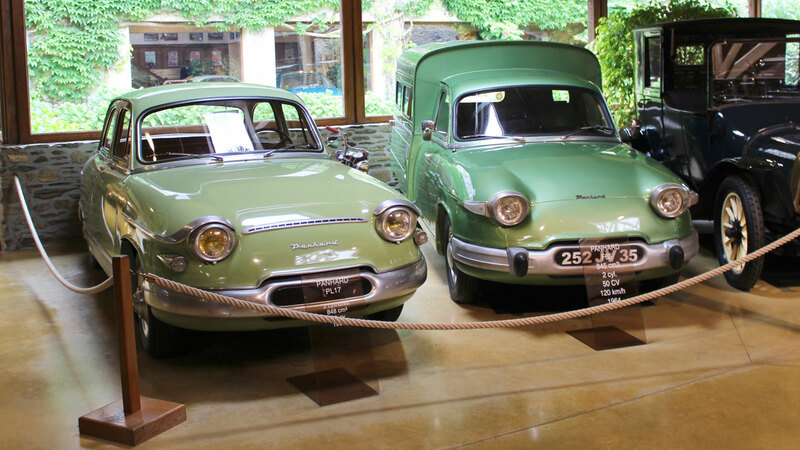 Our recent visit to the Conservatoire Citroen presented us with the perfect excuse to drop in on this magnificent museum. 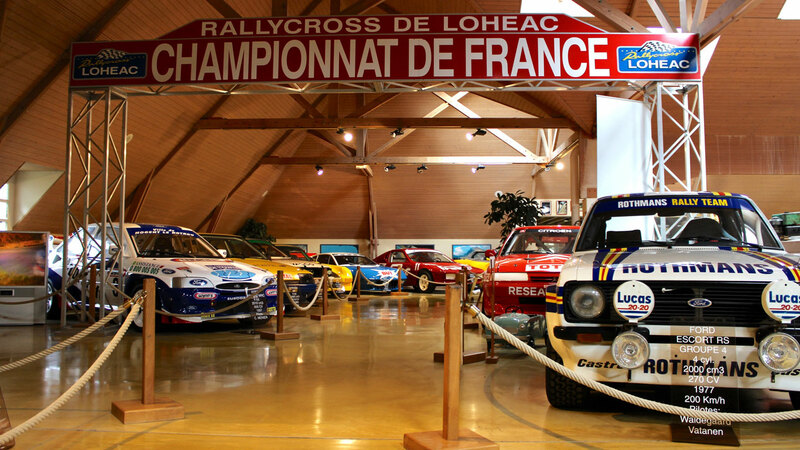 Through the dimly-lit reception area and past the obligatory shop, you’re presented with a hall of French veteran and vintage cars, appropriately named the Hall of Ancestors. Around thirty years ago, The Manor of the Automobile was still a farm. Michel Hommell, who had been collecting cars since the age of 18, purchased the site with a view to housing his ever-growing collection in one place. It took 15 years to complete, with the vehicles displayed in 15,000m2 of exhibition space. 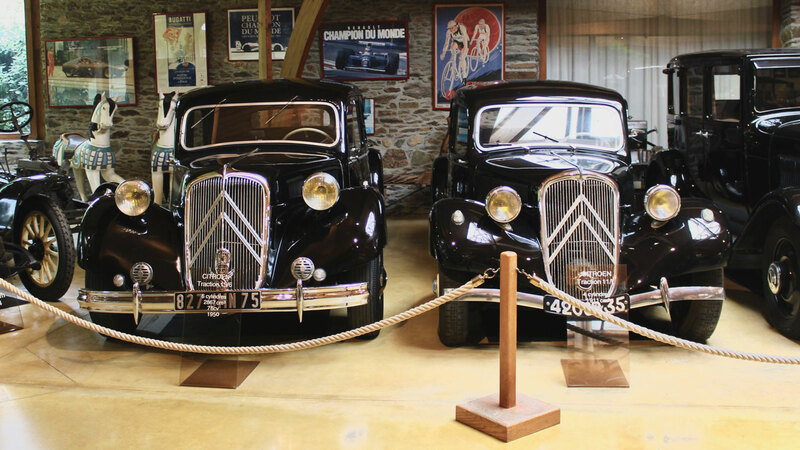 Turn the first corner and you’re greeted with the sight of a pair of Citroen Traction Avants. 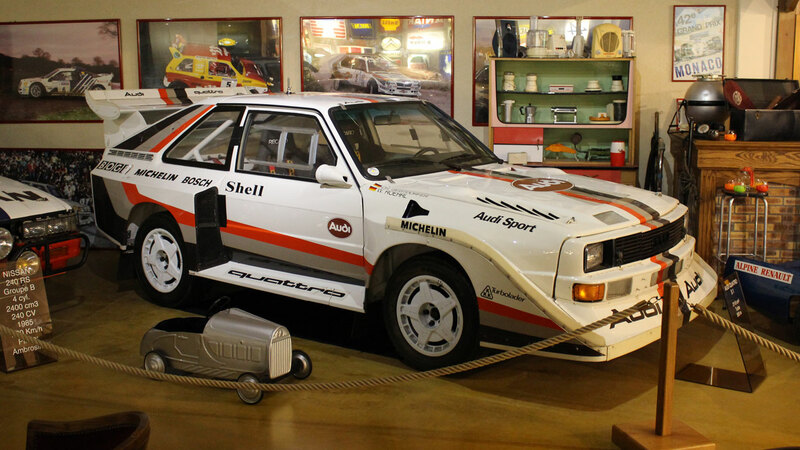 It’s considered to be the godfather of the modern automobile and was the first mass-produced front-wheel drive car. Today, the Panhard name exists as a part of Renault Trucks Defense, but the French carmaker stopped building cars in the late 60s. Some 130,000 PL17s were sold, before production ceased in 1965. 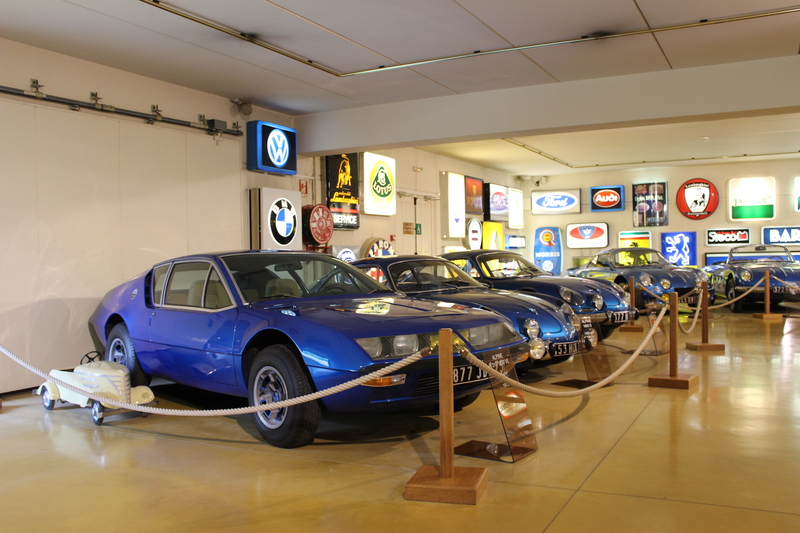 The display of Alpine cars is the first hint that the museum might be about to send your jaw hurtling towards the polished floor. It’s a sea of Alpine Blue and yellow headlights, flanked by backlit dealership logos. 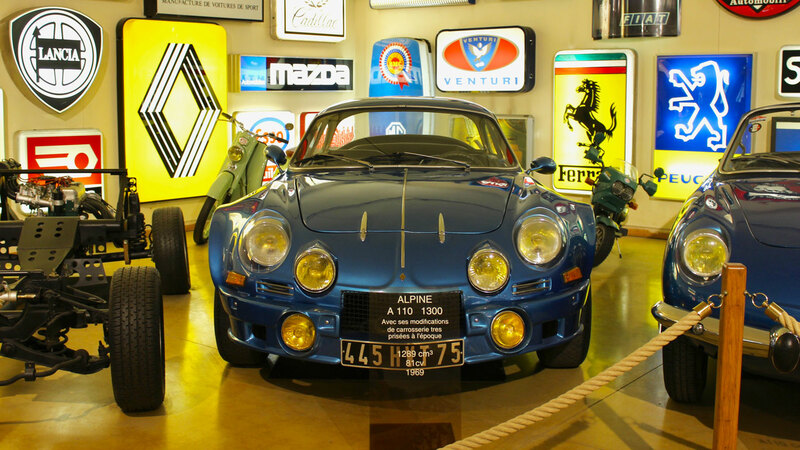 The Alpine A110 was based on the Renault 8 Gordini and proved to be a formidable force on the world rally stage. A new version was unveiled at the 2017 Geneva Motor Show and will hit the roads before the end of the year. From the days when tobacco sponsorship was still permitted and delivered a number of iconic deliveries. 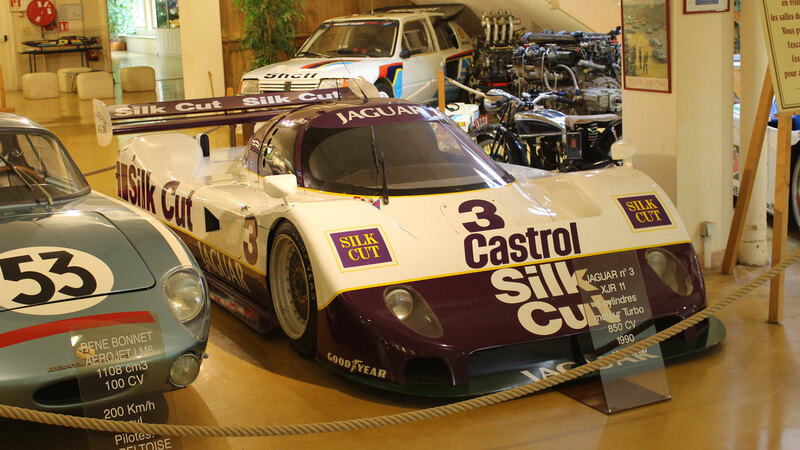 The Silk Cut Jaguar XJR-11 must be up there with the Marlboro McLaren and John Player Special Lotus. How about this Nissan 240RS? 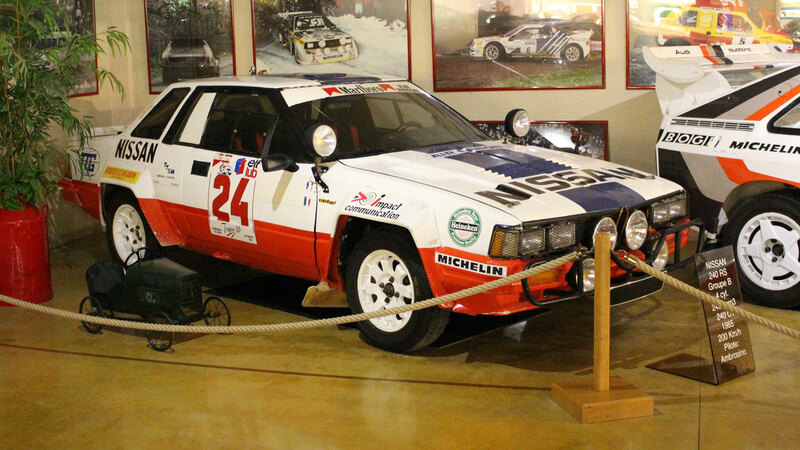 The rear-wheel drive Group B rally car was powered by a 2.4-litre engine and was Nissan’s entry from 1983 to 1985. 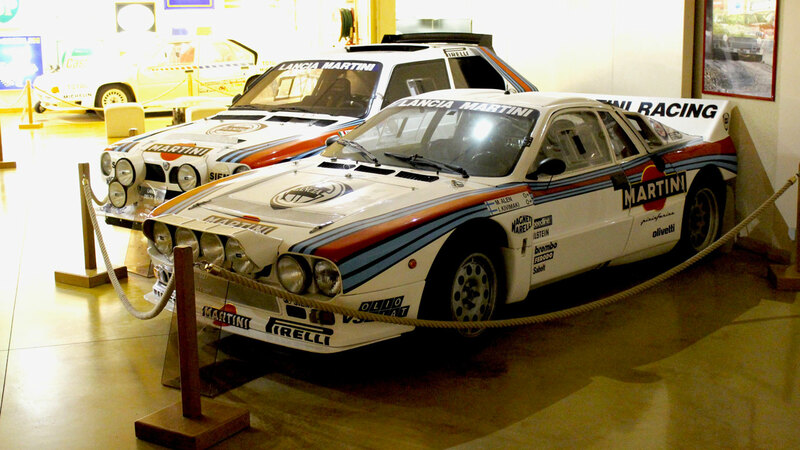 It’s a Martini Racing overload, with Markku Alén’s Lancia 037 and a Lancia Delta S4. Alén and Lancia were joined at the hip throughout the 1980s. 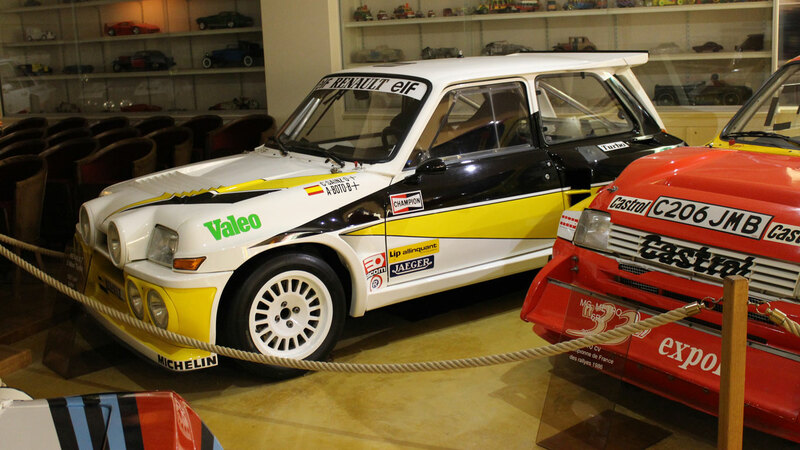 In 1986, Carlos Sainz and Antonio Boto finished second in the Spanish Rally Championship in this Renault 5 Maxi Turbo. Check out the videos on YouTube for the vehicle in action. 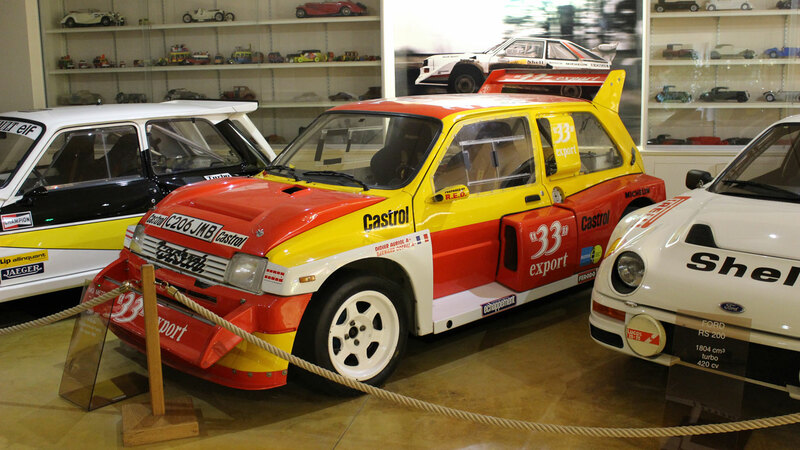 Also in 1986, Didier Auriol won the French National Championship in this MG Metro 6R4. 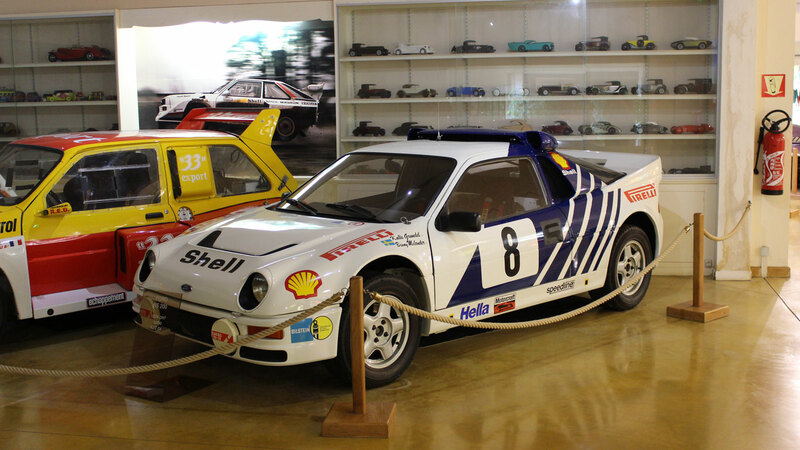 Kalle Grundel drove this Ford RS200 to third place in the 1986 Swedish Rally, his best ever Group B finish. It needs no introduction, does it? 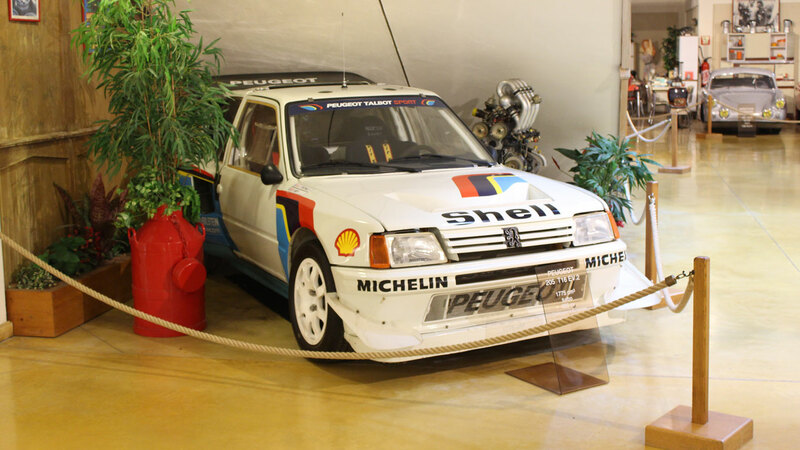 The Peugeot 205 T16 won the World Rally Championship in 1985 and 1986. 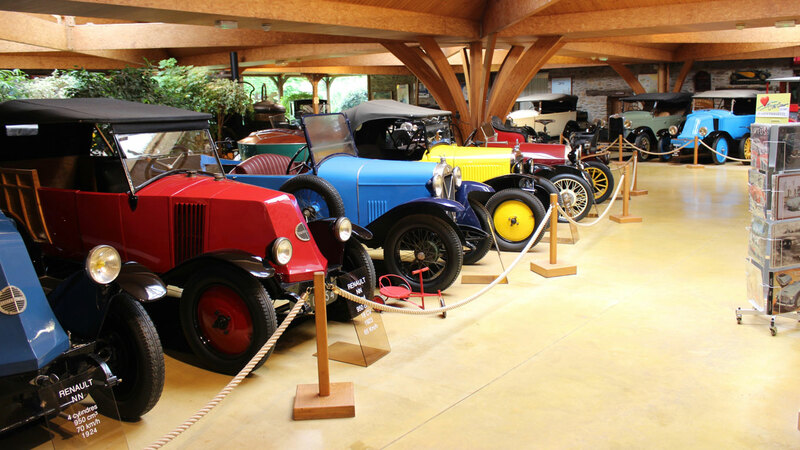 Le Manoir de L’Automobile also includes halls dedicated to Ferrari, Lamborghini, French cars, Formula 1 and more. Look out for our full gallery on MSN Cars soon. https://www.motoringresearch.com/wp-content/uploads/2017/07/01_the_manor.jpg 768 1366 Gavin Braithwaite-Smith https://www.motoringresearch.com/wp-content/uploads/2018/12/mr-top-motoring.svg Gavin Braithwaite-Smith2017-07-12 15:46:242017-07-12 15:46:24Is this Europe’s best car museum? 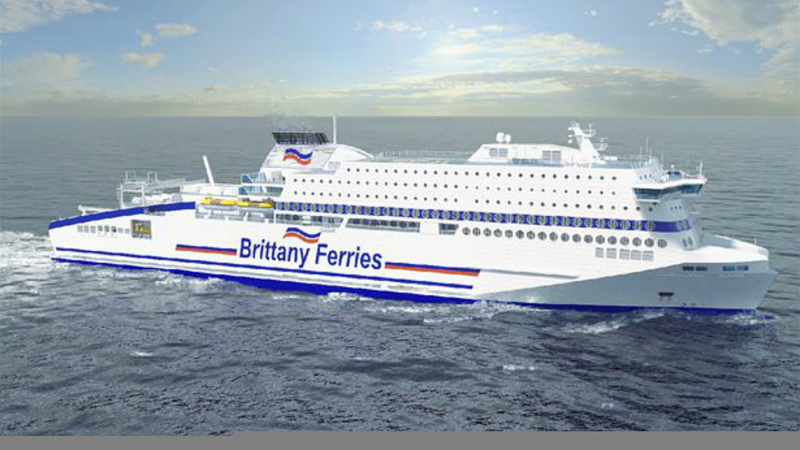 Motorsport fans driving to Le Mans in 2019 should enjoy a more relaxing trip across the English Channel, with the news that Brittany Ferries is investing in a new LNG-powered ferry. The Honfleur – which will operate on the company’s busiest route from Portsmouth to Caen – is scheduled to arrive in spring 2019. At 42,400 gross tons, the Honfleur – named after a harbour town in Normandy – is larger than the ferry operator’s current flagship, the Pont-Aven, making it the largest vessel on its fleet. Free wifi will be available in all cabins and public spaces, making it easy to share photos from your trip to the famous 24-Hour race. Caen is 100 miles from Le Mans and can be reached in just 90 minutes – or less if you’re prepared to risk a roadside chat with the gendarmerie. In common with other ferries operated by Brittany Ferries, the Honfleur will boast bars, restaurants, cinemas, shops and quiet zones, along with a new ‘digital lounge’. The ferry operator claims the ship will be the “greenest vessel regularly operating on the English Channel”. The liquefied natural gas (LNG) powered cruise ferry will burn fuel with no sulphur emissions, much lower particulates and less carbon dioxide than diesel. The quieter and more efficient form of power delivery reduces vibration and noise: ideal if you’re hoping to get some shut-eye after a long night at Le Mans. The Honfleur will ferry 1,680 passengers between Portsmouth and Caen, with space for 550 cars. The route – currently handled by the Normandie – takes six hours, either on a day or overnight crossing. News of the order comes a year since the UK voted to leave the EU, with the Honfleur set for its maiden voyage as Brexit negotiations reach a climax in 2019. The ferry will be built by the German shipyard, Flensburger Schiffbau-Gesellschaft. 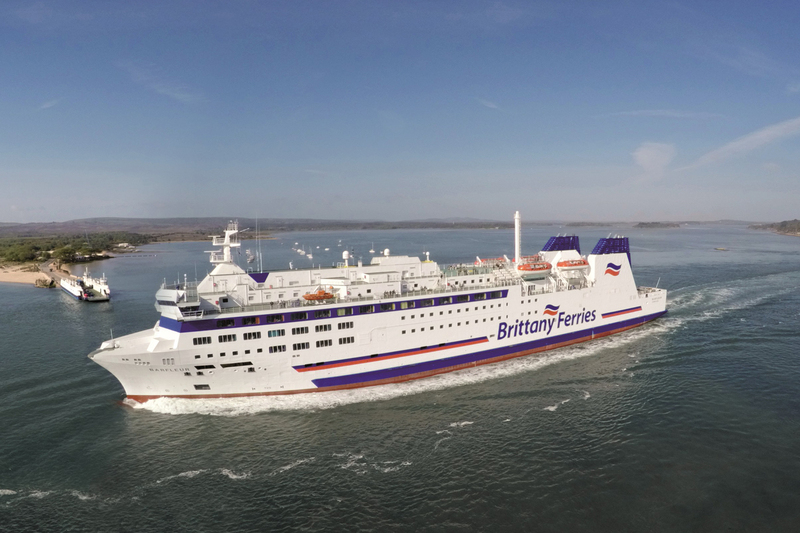 A spokesman for Brittany Ferries told the Daily Mail: “We remain confident about the future despite the challenges of Brexit. Brittany Ferries operates ferries from Portsmouth, Poole and Plymouth, with destinations including Cherbourg, Le Havre, Santander and Bilbao. The company was founded in 1972 by a group of Breton farmers who wanted to export their cauliflowers and artichokes to the UK. Today, it is the largest maritime carrier on the western and central Channel. A new emissions system being introduced in cities across France could see British drivers hit with fines of up to £117 if they don’t display a special sticker that can be bought for just £3.20. The Crit’Air vignette was introduced in Lyon and Grenoble on 1 January, with Paris following on Sunday 22 January. It puts vehicles into six categories based on their emissions: from the cleanest electric or hydrogen-powered cars (Crit’Air 1), to the dirtiest (Crit’Air 6). The categories correspond to the six European Union emission standards for cars – dating back to 1992 when Euro 1 was introduced. Drivers in Paris failing to display a sticker could be hit with an on-the-spot fine of between €68-135 (£58 to £117). There’s a catch, though – the website where you can buy the vignette is only available in French, making it difficult for British holidaymakers to comply with the regulations. An English language website is expected in the near future. 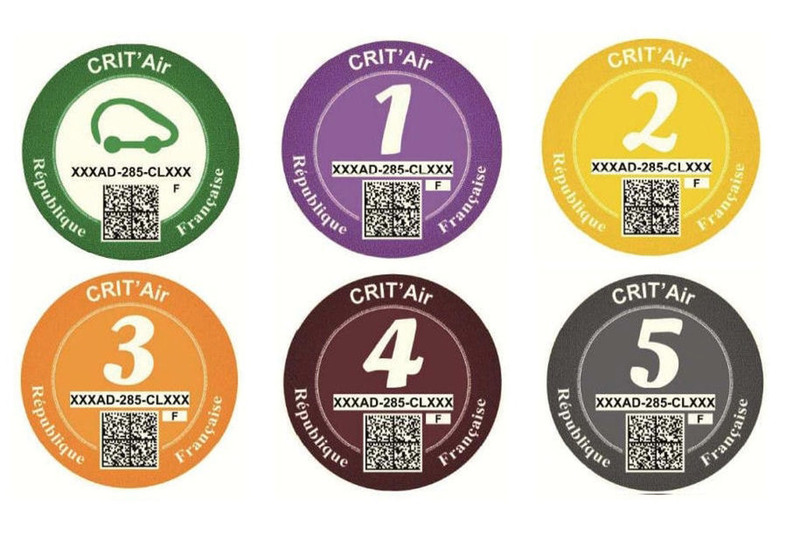 If you’re expecting to drive through Grenoble, Lyon or Paris you’ll need to know the European emissions standard of your vehicle to apply for the sticker. If your car is a modern Euro 5 or 6 standard vehicle (including all cars registered since September 2009), you’ll be able to find its category in section D2 of the V5. The ultimate aim is to ban the highest emitting vehicles from cities across France – particularly on days where pollution is particularly high. Vehicles that are too old to be given a vignette (including cars registered before 1997) are already banned from being driven in Paris between 8am on 8pm on weekdays.